I’m beside myself with excitement right now. Two of my absolute favorite things in the world are coming together to create something completely and totally awesome. Marvel and Funko have teamed up and are releasing their own subscription box chock-full of what will undoubtedly be some pretty awesome exclusives. Christened the Marvel Collector Corps, this service will ship out a brand new box every two months starting this April. I don’t know if every month is going to be themed but this first one will be focusing on Marvel’s upcoming Avengers: Age of Ultron. We’ve even gotten our first peek at what’s inside. Subscribers will be getting an exclusive six inch Hulkbuster Funko POP! vinyl figure. Okay, so, exclusive is a bit redundant there. Everything in these boxes are exclusive. 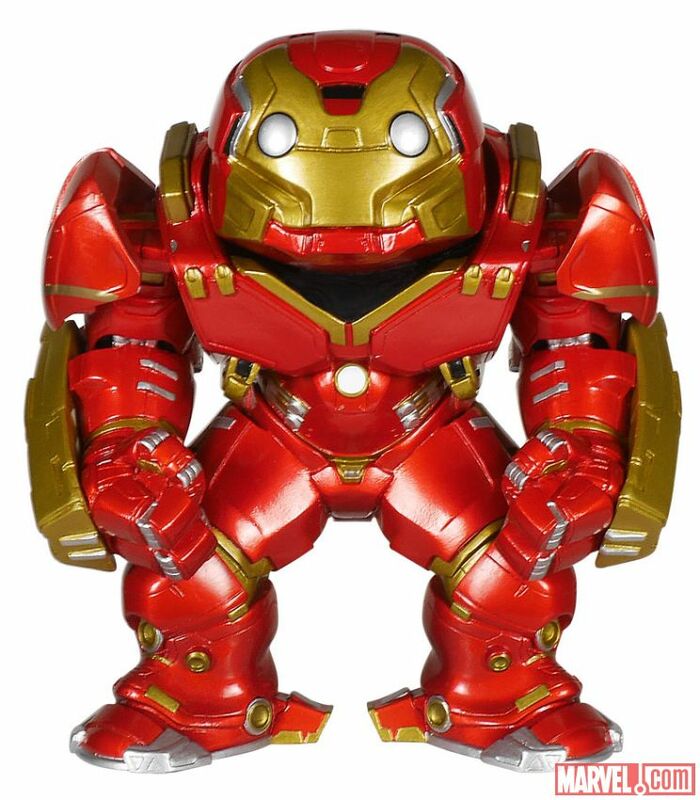 But this isn’t the first time we’ve seen the Hulkbuster figure. The design was released recently but with no information as to how people could get their hands on it. They’ve already revealed that the June box will feature Ant-Man so hopefully we’ll get something awesome along these lines in honor of that film, too. Right now the only guarantee Marvel Collector Corps subscribers have so far is that we’ll get at least $50 worth of value out of the boxes. The difference between the plans? Well, the price is the same. Each box is going to cost you $25 + shipping and taxes regardless of which plan. The only real difference is that Founders pay up front for everything instead of paying for each box individually as they are released. A Founders subscription will set you back about $207 after shipping and taxes (I know because I did it). So far all we know is we’re going to get a “Founders statute” out of it on the one year anniversary. It remains to be seen if there will be any other perks to being a Founder. No matter what plan you pick, if you’re a Marvel fan – and especially if you’re also a Funko fan – this seems like a great alternative to other subscription boxes. I’ve subscribed to a handful of others over the past year or so and while I like Loot Crate and Nerd Block and Geek Fuel sometimes they just don’t wow me on a regular basis. The Marvel Collector Corps subscription box, on the other hand, features everything I have loved about those other boxes: exclusives, Marvel gear, and Funko figures. For me personally subscribing was a no brainer. I can’t wait to get my first box in April and as soon as I do I’ll let you guys know what I think!